A Roth IRA is one of the best vehicles that can help you save for retirement. But what IS it, exactly? How do you define it? And what makes a Roth IRA different from a Traditional IRA? First, the basics: IRA stands for "individual retirement account." That means exactly what the name implies - it's a retirement account for an individual (you). IRA's are set up by the account holder. That means you, rather than your employer, have to take the initiative to create an IRA. How do you do that? Contact any major brokerage service - like Vanguard, Schwab, T. Rowe Price or Fidelity. Each of these companies have application forms online that you can fill out to create an IRA. So what's a Roth IRA? To answer this question, I'm going to have to explain how money inside your IRA is taxed. The $5,000 inside your Traditional IRA grows tax-free throughout the years. That means capital gains and dividends are able to compound upon themselves without first having a tax bite get taken away. This helps you maximize your gains. Eventually, though, when you retire and you withdraw the money from your Traditional IRA, you'll pay the entire tax bill: you'll pay income tax AND long-term capital gains tax. Roth IRA's are taxed differently. If you earn $50,000 and you put $5,000 into your Roth IRA, you'll still pay taxes on the entire $50,000 of income. On the surface, this might sound like a worse deal. Why pay taxes today, when you could postpone those taxes instead? Here's the compelling reason why Roth IRA's are so great: you NEVER pay taxes on that money again, not even on your capital gains and dividends. In other words, the money is allowed to grow and compound tax-free, and when you withdraw that money in retirement, you won't pay a dime in taxes, not even on those gains. 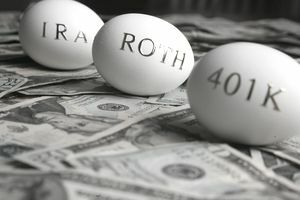 Should I Pick a Traditional IRA or a Roth IRA? Talk to a qualified tax professional about which account is right for you. As a general rule of thumb, Roth IRA's are great for people in their 20s, 30s and 40s, who still have several decades left until retirement. This age group is likely to see the biggest gains in their portfolio, so they'll benefit the most from being exempt from paying taxes on those gains. Also, if you think you're in a lower tax bracket now than you will be in the future, a Roth IRA is generally the best choice. Let's assume you're currently in the 20 percent or 25 percent tax bracket, and you suspect that in the future, you'll be in the 30 percent or 35 percent tax bracket. In this situation, you're better off investing in a Roth IRA. That said, it's almost impossible to predict tax rates in the future, because no one knows what laws Congress will pass. Many people also find themselves in a lower tax bracket when they retire, because they're receiving less income. Again, you'll want to meet with a qualified tax professional to decide which course of action is best for you. Am I Eligible to Invest in a Roth IRA? Not everyone is eligible to contribute to a Roth IRA. First of all, you can only contribute earned, taxable compensation. That means that if you didn't earn a penny this year, you can't make a Roth IRA contribution. As we just discussed, the younger a person is, the more likely they are to benefit from a Roth IRA. As a result, many parents try to set up Roth IRAs for their children. However, parents discover that they can't set up a Roth IRA for their kids unless the child is earning taxable income. Secondly, your income must be underneath a certain threshold. This article explains the eligibility and contribution limits. What If We're a Married, One-Income Household? If you and your spouse file a joint tax return, both of you can each make IRA contributions, even if only one of you has taxable compensation. In other words, if your household consists of a working mom and a stay-at-home dad, or vice versa, both parents can each contribute money to their own IRA. It doesn't matter which spouse earned the compensation. Your combined contributions - as a couple -- can't be more than the taxable compensation that's reported on your joint tax return.